These cupcakes are sweet! Very appropriate for kids or adults with major sweet tooth. They are yummy, though. I love the filling, but I recommend cream cheese frosting if you plan to serve them to grownups. I also intended to have speckles of vanilla bean throughout the cupcake, but my vanilla beans were dried out! Oh well, next time for sure. Have a happy holiday and see you all next year! 4. Gradually add remaining sugar until you get to the consistency and sweetness you like. 1. Add cherries, water, and vanilla to a pot. Cook for 10 minutes over medium-high heat. 2. Stir together sugar and cornstarch then stir into the cherries. 3. Cook until thick, about 20 minutes. 1. Fill each cupcake with filling. I used the “cone method”, but many methods will do. 3. Top with a rinsed and patted dry maraschino cherry. They are super cute! I bet the cream cheese icing would be great. That top photo has got to be the best cupcake photo I have ever seen. I love it! You could almost sell it as an art print. The cupcakes look and sound so good! Dang girl, you got busy with the cupcakes! very cute and dear looking. the red cherries just pop! kinda retro. Cute! My kids would love these. How about adding the filling before you bake? What a gorgeous, frame-worthy photo! No more digging in the roy rogers glass for the maraschino cherry: here it is front and center! Those look lovely. We didn’t have cherries at home–but we have more strawberry preserves than we know what to do with. So I added the Strawberry as a filling instead of cherry. Everyone liked it a lot. Thank you for the recipe and method. Merry Christmas Cheryl! So glad to see u back blogging again! And thanks for all your sharing in 2006! Have a Happy New Year! Okay, I’ve been a long time lurker here, this is the first recipe I made. Came out great only… how the hell do you do that frosting layer on the top to be so pretty? It looks like you lay down a layer and flatten it, then a smaller layer doing the same thing? Or do you have some pastry tip I don’t know about? These look wonderful. Seems like a quick and easy recipe too. I can’t wait to try it. 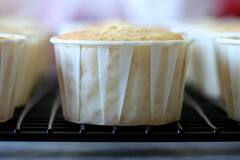 How do you get the cupcakes to bake flat (and not domed?). Chockylit, well done – yet again! Many thanks for being so generous with your baking tips and techniques and your lovely recipes. These pictures made me sit up the minute I saw them, and I intend to make them next week (too busy this week) – the first time I shall be trying out a recipe of yours! Can’t wait! Heartfelt thanks once again! And Happy 2007 to one and all! I made my first few cupcakes yesterday using your recipe, what a delight it was! However how did you get the frosting on top? I had so much trouble decorating it, it never turned out the way you have done it on your photos. They are so pretty!! Adorable. My birthday is this weekend and I think I shall make these for myself! i tried to make these yesterday, but the cake turned out really weird and didn’t rise hardly any! i ended up throwing them out, but i think i’m going to try again. oh, and i used raspberries instead of cherries! 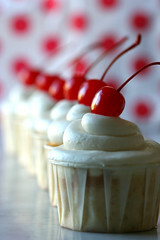 Hi Cheryl, I just stumbled upon your site today which is beautiful, as are the gorgeous cupcakes. Cupcakes may not be the root of all happiness, but super close I imagine. oooh. I made these cupcakes today and wow! They taste absolutely great! I did not have a problem with them rising over the top of the cupcake paper or pulling away from the paper. So I’d probably fill them up a little bit more next time. And there will be a next time. I still haven’t figured out how you got the frosting done so nicely though…hmmm…maybe I’ll just have to keep making these cupcakes until I get that part right! Hi there, just found your site. Love it and love cupcakes. Not much of a baker though. I’d like to try these but not sure of what the “cone method” is for filling. Thanks! I recently found your site and just had to try these. The batter alone is incredibly delicate and delicious, and your instructions are excellent. Thank you for sharing your baking expertise with us! Wonderful recipe! I made these last night and am getting rave reviews from friends, family and coworkers! As a new baker, I’m still experimenting with getting the right consistency, color and design with the icing. I don’t have any fancy tools so I used a ziplock bag! I used this as an inspiration for my own cupcake! 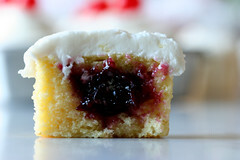 I used vanilla beans and hulled black cherries though, and no frosting in lieu of a sugar crust. Very yummy! Hi, This is my first post, having been an avid reader and benefitter for a long time. As usual, these were delicious. However, I thought it was odd when I read the recipe that you added the sugar/cornstarch mixture to the hot cherry mixture but thought I should follow the recipe. As I feared, there were little cornstarch balls in the cherry filling. I think it would be better to mix the cornstarch into a slurry with part of the water you are using for the cherries and add it as liquid to prevent this from happening in the future. However, thanks for your great blog! Love your site. Yum! Can anyone tell me where I can find pink bakery boxes in SF without having to buy a case? Also, what are your favorite cupcakes on this site? these cupcakes are delicious! i made these for a friend’s birthday & they all loved it. thanks for sharing! I’ve made two different variations on this, one with raspberries and one with a combination of strawberries and cherries, both of which were completely delicious! Because I’m in high school I wanted to find a cupcake that was cute enough, but not to so unbelievably sophisticated that senior boys wouldn’t like it, and this worked perfectly! 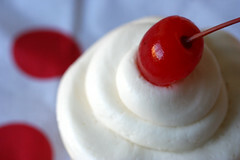 I would love to feature some of your cupcake photo’s and know how. I made these! And they turned out wonderful! I just LOVE these I am going to make them for my sons 3rd Birthday :) Thank you for sharing! I stumbled across your site while looking for “different” cupcake recipes. I made these this morning. My husband came home from work to find them sitting on the counter. He cut one in half to try it and had to call me at my office to tell me how fantastic they are. I did use a cream cheese frosting and piped it on with a small ziplock bag with a small snip in one corner. Now I can’t wait to try the other half! You have so many interesting cupcakes, I can’t wait to try more of your recipes. Thanks so much for sharing!